ALA was a transformative experience. How can I even explain it? I went to dinner with seventeen lovely people, professionals in the children's lit field, all of whom have read my book. As we ate, all around me, people were talking about the book. They were excited about the book. They loved the book. Is there any way to explain what this was like? How much do I love Houghton Mifflin Harcourt for throwing a dinner and inviting all the people who love my book and no one who hates it? I am so lucky to have had the experience of this dinner. I will never forget it. And I hope I'll get the chance to meet everyone again and talk more -- what an awesome, funny, interesting group of people (and no, I'm not just saying that because they like my dumb book)! Thank you, everyone who was there! Folks, I'm really sorry, but I've got nothing today. I'm all tapped out; I'm beyond overwhelmed. Instead of trying to come up with something clever and interesting to say, I'm going to shut my blinds and turn off my phone and turn off my computer and stick in some earplugs and take a little nap in my armchair. I'll be back on Monday with a report from the adventure of ALA, which begins tomorrow. I have a complaint about Earth: it rotates too fast. Normally, I'm all for Earth. I get all weepy when I see pictures of Earth from above and I adore lunar eclipses and I hate people who kill sea turtles and all that. Earth is my home. However, the fact is that at bedtime I don't ever want to go to bed; there are too many fun things I want to do; I could easily stay up for another two hours, then get my 8 hours of sleep, and wake up to another day of the same schedule. Why can't I have 18 hours to be awake and then 8 for sleeping? Earth rotates just a bit too fast. Am I the only one who feels this way? Don't the days seem too short? What are we to do? If I had two extra hours a day, I would use one hour to read Lord Peter Wimsey mysteries and one hour to eat ice cream and listen to music I've never heard before. What would you do? So, needless to say, the team of my iMac and me are not about to break out as the next great thing in photography, and I probably could have combed my hair, but I thought I'd post this anyway to give you a sense of what my books look like as I'm writing them. This is from very near the beginning of the first draft of Graceling -- the end of Chap 1 and beginning of Chap 2, to be specific -- and also looks to be my first attempt at a map of the Seven Kingdoms. 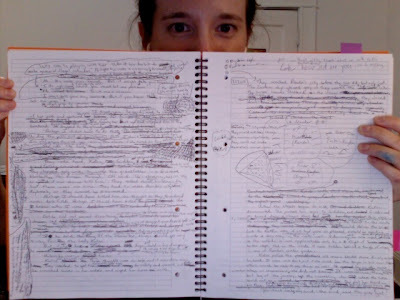 Writing longhand can get messy, but it's the way I love to do it -- I love to be able to touch what I'm writing. Digging this up was a blast from the past. Pictured is Notebook #2, and the date in the corner of the righthand page is 9.17.04. I'm currently writing in Notebook #11. So, first, the important news. I have learned from a recently played game of MASH that it is my destiny to marry Jason Bourne. We will have 32 kids and live in a house in Alpha Centauri, and we'll drive a sparkly, polka-dotted duck boat. I will spend my days as a fire eater, and live happily ever after. A Woman, a Plan, No Canals: Bitterblue! A curious Owlet has asked me to say a bit more about my book plan for Book 3, so I thought I'd do that here. Don't worry, no spoilers -- I'm not going to tell you what's in the plan, I'm just going to talk about how the plan works. This post is brought to you by wise things other people have said. Here's what Natalie Goldberg says in Writing Down the Bones: "Right before you are planning to write, a good preparation is to become an animal. Move slowly, stalking your prey, which is whatever you plan to write about, no matter what else you might be doing at the moment -- taking out the garbage, walking to the library, watering the garden. Get all your senses intent." My sister Cordelia (all names have been changed to protect the innocent) and I have differing religious philosophies, but we've always agreed on one thing: neither of us has ever wanted to be visited by the Virgin Mary. When I was little (and actually believed in the Virgin Mary) I was terrified of a visitation, mainly because the last thing on earth I ever wanted to be was a nun, and I just knew the Virgin Mary was going to appear before me and tell me it was my destiny. Cordelia, on the other hand, wasn't worried about anything the Virgin Mary might say to her. Her worry was that the Virgin Mary would visit her while she was naked in the bathtub, which would be embarrassing. My ideal home is on a hill in a forest that has tall deciduous trees, deer, small black bears rarely seen, and giraffes. There's a cliff nearby that overlooks the ocean, and in the ocean are dolphins and whales, and occasionally nice people in boats and helicopters who are scooting around making sure the dolphins and whales are well protected. My friends live in various parts of the forest, and it is wonderful to have them near, and they all understand that the "Do Not Disturb" sign I sometimes have on my door is not personal, and also that it is not always there.